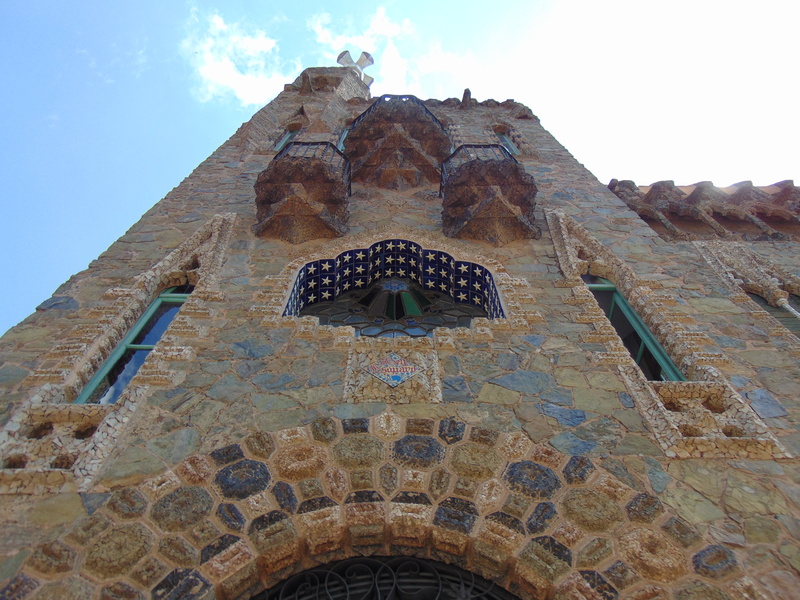 I’ve already written about how much I loved Barcelona (here and here), and how most of our time was spent on Gaudi pursuits. 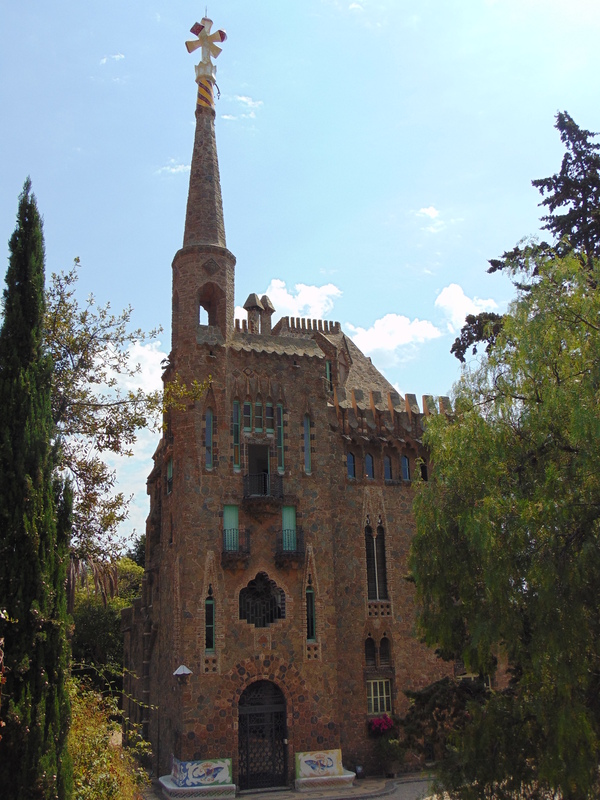 Torre Bellesguard is one other Gaudi building we visited, and as it’s a little off the beaten track you can actually enjoy it a bit more – nobody tutting at you for stepping in the way of their selfie, no long wait for a photo opportunity of the most stunning spot. Dr HH and I both rated this as our top Gaudi site, largely because we were actually able to get close to things and enjoy it. We booked in advance, but that’s not necessary. The visit cost €9 each with an audio guide, and you can turn up at any point during opening hours but you might have to wait a little while for a staff member to guide you through the inside. Not that waiting around in the garden is a bad thing – the building and grounds are stunning, and the more you look, the more rewarding it is. The inside is not too shabby either. We had one “guide” who took us from room to room and told us which audio track to listen to, while he played on his phone, and we were a group of seven tourists wandering around. This is very different from the scrum in Casa Batllo. 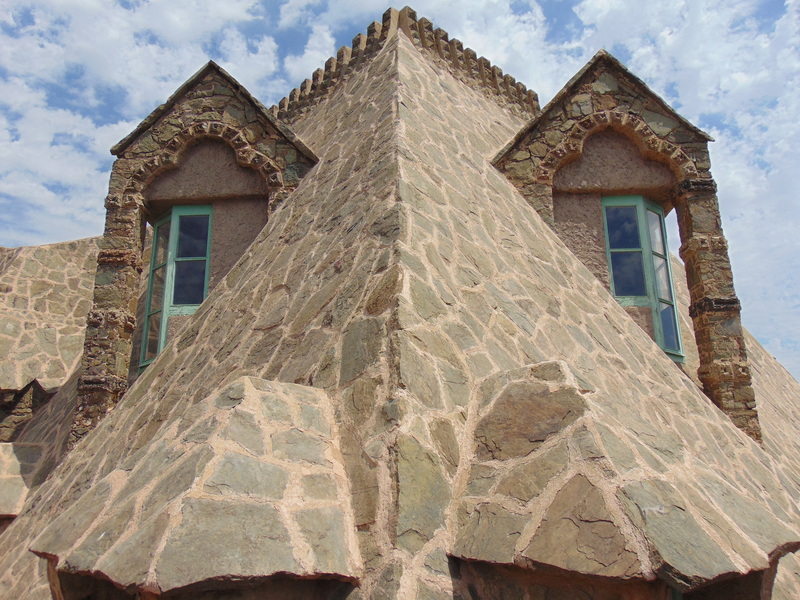 It’s impressive to get up to the roof and see this face peeping at you: it’s a dragon! The big spire on the building represents St George’s spear, so this is the perfect spot for any proud English person to visit. And any person, English or not, should prioritise a visit to Gopal (UPDATE: closed May 2017), a vegan deli in the heart of the city. 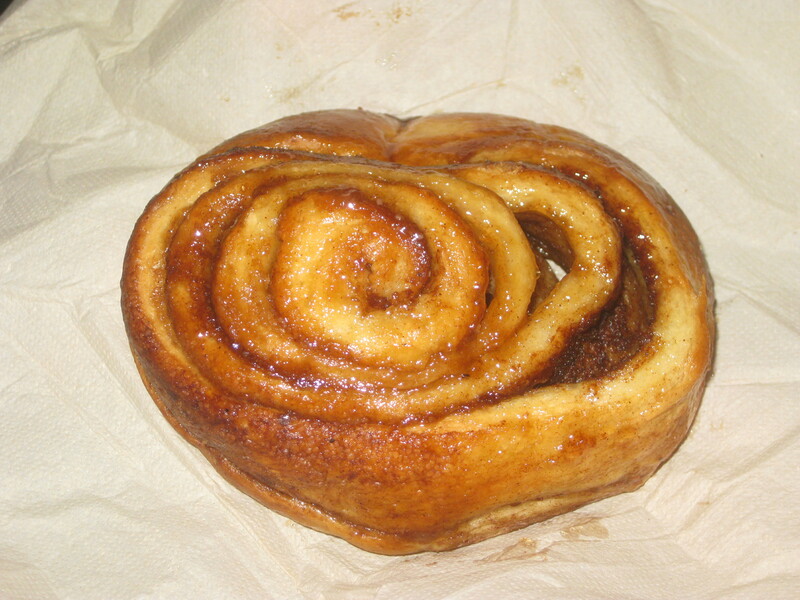 We had these cinnamon rolls for breakfast on more than one occasion (bought the day before and eaten in the comfort of our Airbnb – there’s no seating in Gopal and they don’t open at a respectable breakfast hour for me). They kept really well, and were gooey, sticky and sweet. We also found room for a donut. This was so good! It’s been a long time since I’ve had a chocolate donut, and I’d forgotten how the chocolate cracks as you eat. When will vegan donuts come to Prague?! 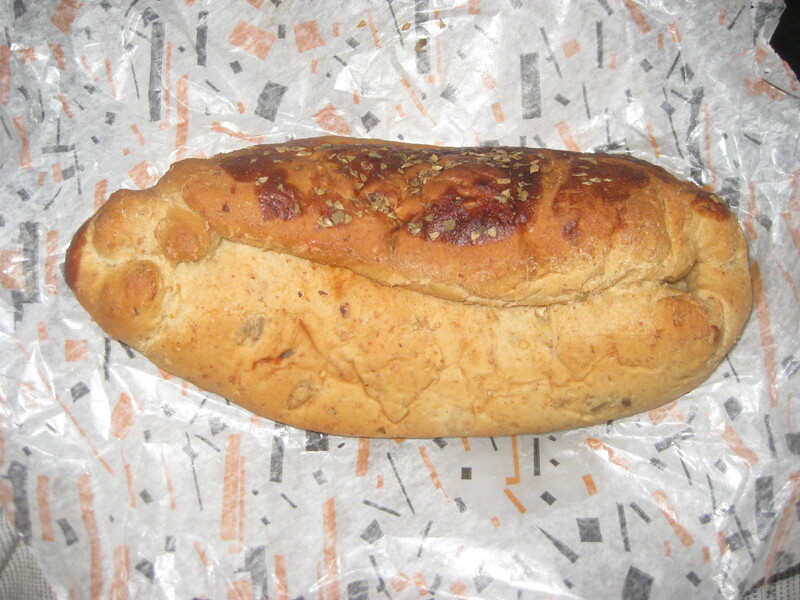 …but this pizza bread roll was the star of the show! 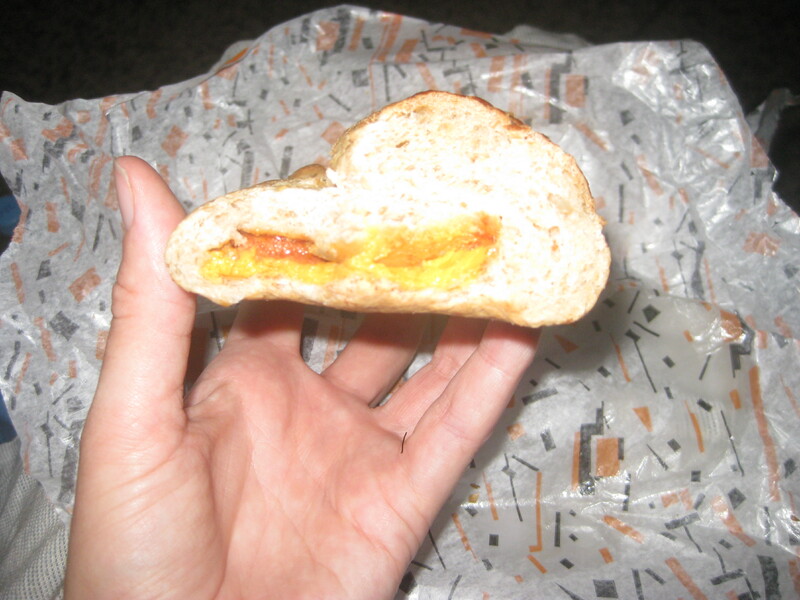 It was stuffed with a layer of vegan ham, cheese and tomato sauce. 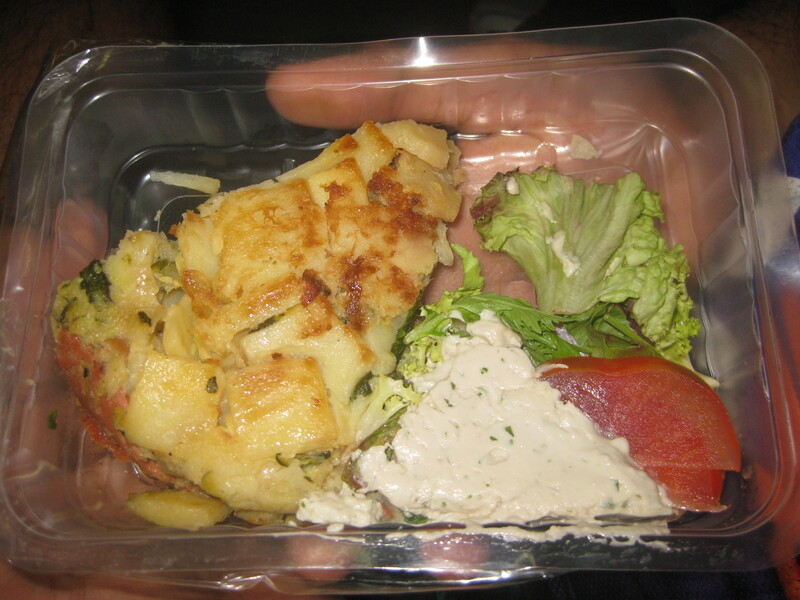 There was so much filling, especially the ham, that it was really good value for money. Gopal appears to be most famous for its burgers, and also seems to do a good trade in their own meats and cheeses – I’d love to go back and check out more of the options. But, let’s face it, I’d probably just stuff my face with baked goods again. 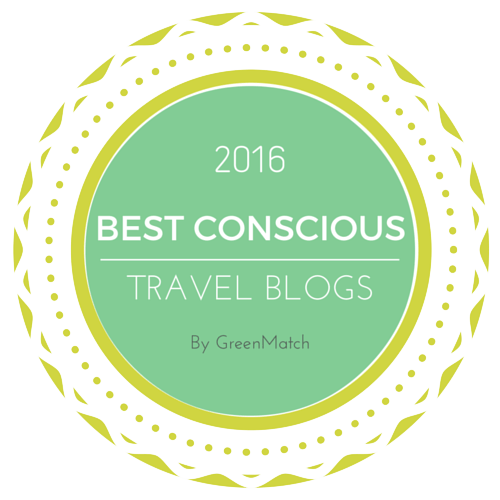 This entry was posted in Travel, Vegan Mofo and tagged Gopal Barcelona, vegan Barcelona, vegan mofo, vegan travel, vgnmf16. Bookmark the permalink. The dragon face is so neat, and the pizza bread roll sounds perfect! Thanks, Julie! I loved the dragon face! The pizza bread was definitely a winner! 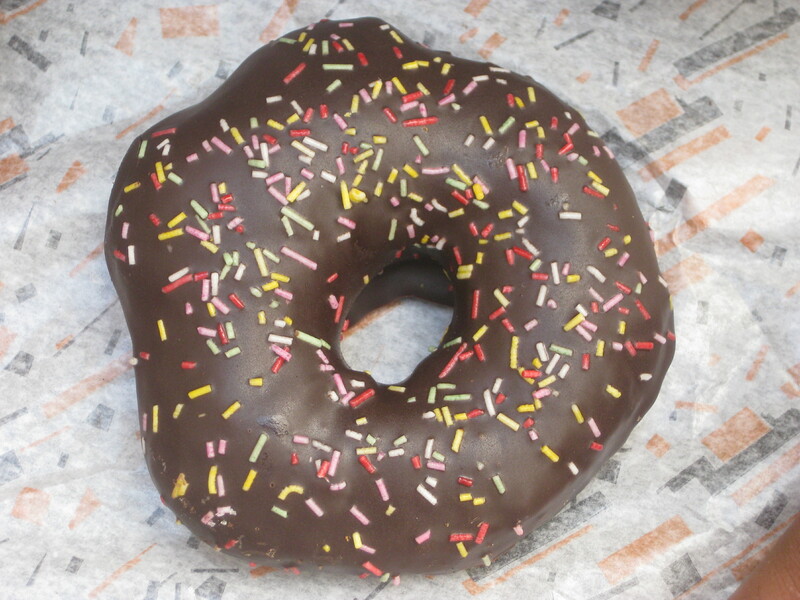 You’ve been to some really great places recently, and eaten some great food – Chocolate donuts being a case in point! There’s a new place selling them in London, and I never used to like them, but I’m totally convinced now! I’m glad you were converted! I loved them when I was a (non-vegan) kid, so there’s something really special and familiar about them now. The Gaudi looks awesome. I love when places give tours so you can see the inside of buildings. 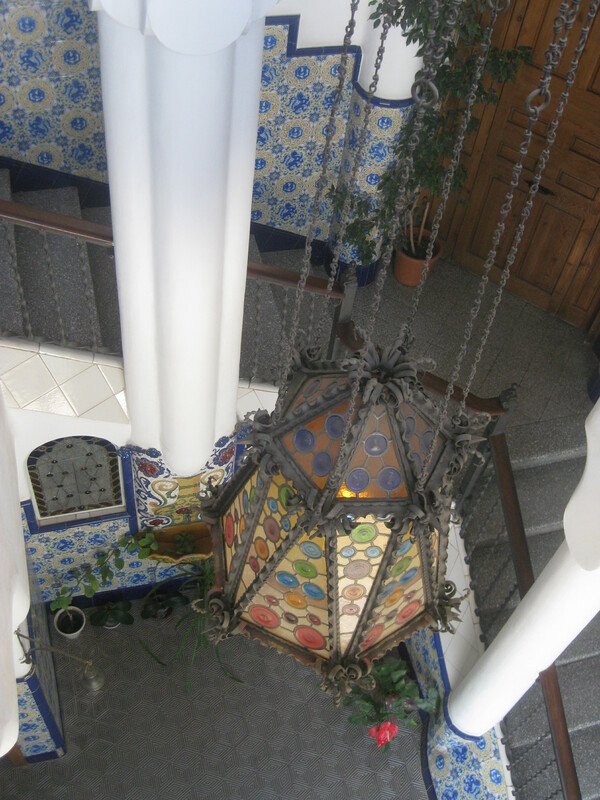 There’s so much good Gaudi stuff to see in Barcelona, and I think was the cheapest, so I’d definitely recommend it. Good luck recreating the pizza roll – I should probably try to do that too, it was delicious!